This is our answer to skin in need. Sometimes skin needs a little extra to soothe and protect. Our Face Cream is formulated to take moisturizing to another level. Each ingredient has been chosen to soften skin, absorbing quickly, leaving your face with an ultra sheer layer of protection against environmental assault. 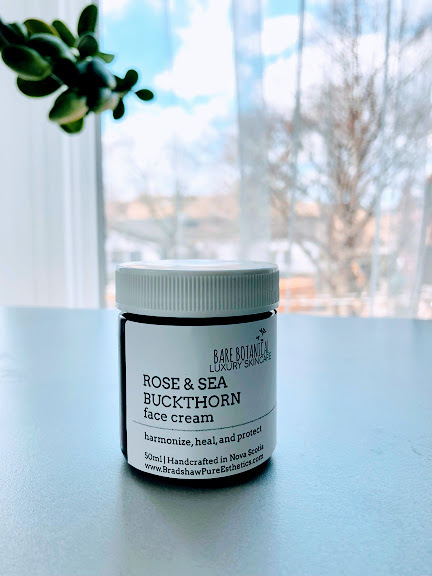 Rose and Sea Buckthorn Face Cream feels light, and has a delightfully sweet and uplifting scent. Its texture is extremely smooth and melts into skin with ease. Use it on its own, or as an added boost to your face oil. Sea Buckthorn - Used for centuries to treat burns, scars, and even reduce signs of aging. Rich in essential fatty acids, tocopherols, phytosterols, and carotenes. Tamanu - diminishes the appearance of scars and it encourages rapid repair, hydration and cell renewal. Anti-microbial, anti-bacterial, anti-fungal and anti-inflammatory, tamanu promotes tissue regeneration and is one of the best known ingredients for healing damaged skin. Roses - powerful humectants. They are plumping to the skin, and strengthen elasticity and connective tissue. Warm a small amount of cream between fingers and apply a thin layer to face and neck. May be used on any skin in need of a luxurious moisture treatment.